Forever talented at captivating a crowd, Quintino has had a prolific year so far hitting well over 200 international gigs – each featuring his signature high-octane stage performance and emanating good vibrations for all. A well-established and highly acclaimed artist in today’s dance music scene, Quintino has captured the hearts of fans all around the world. His standout big room sound is explosive on all levels and has allowed him to gather recognition from all walks of life. Boasting kinetic, blood-pumping live performances, Quintino sets himself apart not just in the eyes of his fans in the global club and festival scene, but in the ranks and dance charts as well. Listed for four years in a row in the DJ Mag Top 100, he currently sits at #30 after making a major jump in 2016 from #80 to #32. Holding over 40 million Spotify streams on “Freak” and 75 million on “I Just Can’t,” both alongside fellow Dutchman R3HAB, it is no doubt that Quintino holds mass appeal and by now, is no stranger to mega success. The Dutch master returns with a smashing bang on his latest release “Heey Ya,” out this past Friday, August 24 on Spinnin’ Records. Beyond ready for release, it has been teased on main stages of festivals all season long with nothing short of a grandiose response from the crowd. “Heey Ya” boasts that wildly amped-up gigantic sound we all love to rage to amongst a sea of tens of thousands of people, all feeling the same electric synergy. Energetic and free-spirited, this track will certainly get you off your feet in an instant. Paired with a fun-loving official music video, this song captures the true essence of festival season and good times with friends. So many celebrations have been in store in 2018 thus far, certainly with more to come in the remaining months of the year. 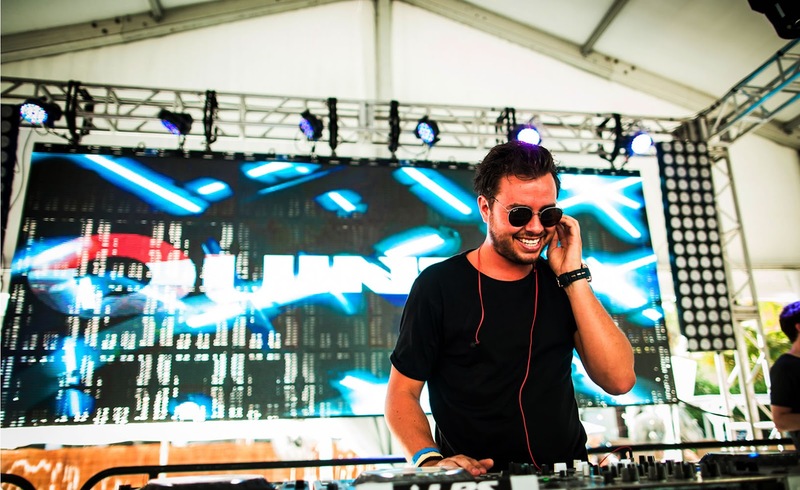 Quintino’s solo track, “Brasil Connect” gathered up major support from top-notch artists including Diplo, Dillon Francis, and Steve Aoki. Other noteworthy collabs included “Woest” with Hardwell, “Knock Out” with Deorro/ MAKJ, “Patser Bounce” and “Slow Down” with Dimitri Vegas & Like Mike, and “Mayhem” with Steve Aoki, all of which largely hit the festival scene this season. On top of this, his “Epic” collaboration with Sandro Silva landed as the #3 most played track at Tomorrowland this Summer. Read below for our Nocturnal Times exclusive interview with Quintino, where we discuss major achievements in recent months, the ups & downs of the producer lifestyle, standout memories, hot collaborations, and more. The Nocturnal Times: Since becoming a globally recognized producer, you’ve had the opportunities to play shows at the world’s most noteworthy festivals including Tomorrowland, Ultra, EDC, Dreambeach, Electric Love, Beyond Wonderland, Spring Awakening, and so many others. How does it feel to perform at such massive events? Did you use to be just another fan in the crowd? Quintino: For me it’s just the best feeling playing on these amazing stages for such large crowds. It gives me the chance to go all-in because everything is just perfect, production of these events is always top notch. To be honest I’ve never been a fan in the crowd, I started djing at a young age, so when all my friends would go to festivals I was already busy doing shows traveling. The Nocturnal Times: How have you developed as an artist and producer since the days of being picked up by Laidback Luke? How have you crafted your sound over the years to adapt as you’ve learned and grown from experience? Quintino: Music wise we’ve grown and learned so much over the years, developing better sounds. And when I started to DJ I focused on mixing and my set. Nowadays we give a full Quintino show, my set contains 95% Quintino music, we have special visuals, lighting, sfx is all timed and coordinated so it’s perfectly matched with the music. The Nocturnal Times: By this time you’ve worked with many of the top names in the dance music industry, (Afrojack, Steve Aoki, Tiësto, Nervo, Hardwell, Dimitri Vegas & Like Mike etc.) What are some takeaways or funny moments you’ve had that you think back on often/ keep at the forefront of your mind? Quintino: Well one that comes to mind straight away is the shooting of the music video of “Mayhem” with Steve Aoki. I came to the States from Asia so I didn’t have any winter clothes with me, and then the director decided we were going to shoot some scene outside, but it was full on winter with snow blizzards and everything. So Steve and I ended up shooting for hours in the snow it was sooo freaking cold. But in the end we just had so much fun shooting the video and it turned out really really cool. The Nocturnal Times: Your latest single, “Heey Ya” was set for release this past Friday, August 24th with Spinnin’ Records. This is a hard-hitting and powerful track that is easily unforgettable to the crowd. How does it feel to finally be letting this one out to your fans? Quintino: Really excited to send it out now, have been teasing and playing the song in my sets for a long long time. We created it to be the final track of my set so I can finish my sets with a lot of energy and it has been working really good. So excited that everyone now can also listen to it at home or in the car. The Nocturnal Times: What other releases have come out/ have you been working on recently? You’ve unleashed some major collaborations so far this year – what were a couple standouts? Quintino: There are three new releases coming in September and October. The first one after “Heey Ya” will be Garmiani’s remix of “Epic” which will be released early September on Musical Freedom. Its been getting crazy DJ support at Tomorrowland, I believe it was the #3 most played tracks of TML. Another track which I hope to release soon is a new collab with DVLM. We’ve been playing it for a long time now, as soon as we’ve cleared the sample we used the track will be released. The Nocturnal Times: Your Go Harder EP series continues since its inception in 2016, with Pt. 4: EDM’s Revenge, out this past March. What can you share with us about how this series has developed over time, or how each part flows (or doesn’t) from one to the next? Quintino: Well I started with the Go Harder EP series so I could experiment and try out new stuff & really give me different DJ tools for my sets. So actually every EP we start by looking at what I need or want in my sets and from there we start working on the EP. The EP series just grows with my sets, when we started with the series, for example, there was more trap and experimental sounds on the EP. The last EP I went a little more back to my roots with some more big room sounds. Basically, for the EP there are no rules so the next EP can be totally different again. The Nocturnal Times: What’s your favorite aspect of the job? What about your least favorite? Quintino: I really like the shows and having that connecting with a fully energized crowd. And although all the traveling brings you all around the world and gives you the opportunity to see all these crazy places, the constant traveling can also be very very hard, spending sometimes more than 20-30 hrs in a plane for a weekend. The Nocturnal Times: You mentioned wanting to take things (music, performances, production) a step further in 2018. What have you done to bring this vision to life so far, and what are you still hoping to accomplish that you may not have already to round out the year? Quintino: Music wise I think we really succeeded, been releasing music every month. Worked together with huge names and all the tracks have been getting really amazing DJ support. This year we really work on finalizing a ‘Quintino’ show, as I said earlier I now play 95% my own music. My show had never been this good, and I want to bring it even further next year creating our own crew so we can even go further with my shows.